That’s right – long copy usually produces better response. But I do believe some sentences in the copy must be short. 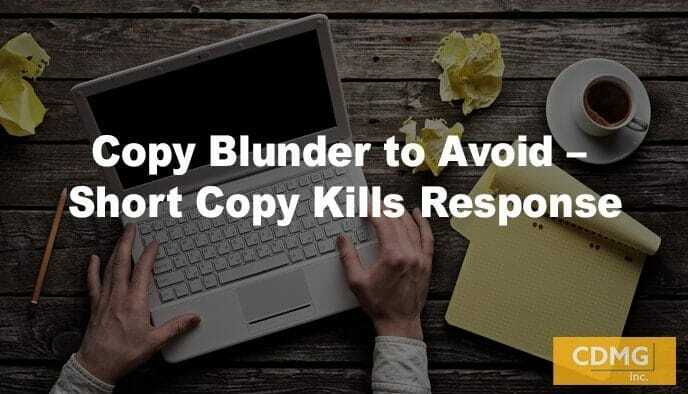 In fact, many direct response copywriters make a vital blunder in starting copy on a direct mail letter, email, ad, or website with a long first sentence. Direct response copy rule that can increase your response: Keep the first sentence and paragraph of your copy short. Remember, your reader will form an instant impression of your market by reading the first sentence, so keep it short. This means your email, postal letter, banner ad, and website should start with a first sentence. A short opening makes the copy more inviting and easier to read. Physically, it helps with connecting to your prospect. It becomes less intimidating and more inviting. Check your marketing copy now. Do you need to shorten it? Feel free to contact me if I can help you write better copy. Email Caleb at caleb@cdmginc.com or call me at (310)212-5727.